John Ross Bowie and Jamie Denbo join Jordan and Jesse Live at the UCB Theater in Los Angeles for a discussion of seeing high school plays while high, old timey baseball teams, and euphemistic waterslide names. Wham Bam Pow Ep. 91 - Total Recall LIVE! This week, Cameron, Rhea, and Ricky are coming at you LIVE from the UCB Theater in Los Angeles to tell you all about Total Recall! Plus, producer Lindsay shares the movie that made her, and we all wonder why the TMNT are such scumbags. It's the MaxFunDrive! Become a member or upgrade your existing membership NOW to support Wham Bam Pow and all of your other favorite Maximum Fun shows! Next week we'll be watching Tank Girl, which is available now on Netflix Watch Instant. Jessica St. Clair and Lennon Parham play best friends on TV, and if their on-screen chemistry seems real, it is. They met doing improv comedy at the Upright Citizens Brigade Theatre, and have been writing partners ever since. They co-created and star in Playing House, a new comedy about female friendship that's more reminiscent of Lucy and Ethel than it is Carrie Bradshaw's gang. Playing House airs on the USA network Tuesday nights at 10/9c. Bonus audio: Parham and St. Clair talk about their beginnings at the UCB. Whether you're looking to zombie-fy yourself, or get absorbed into the world of a contract killer, Boing Boing's Mark Frauenfelder's got just the game for you. He's the host of the Gweek podcast, and he drops by to suggest a couple of his favorite new games. 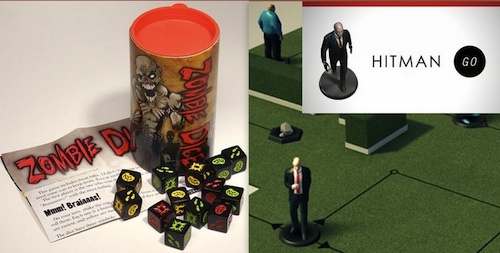 He recommends checking out the multi-player Zombie Dice to collect brains and avoid shotgun blasts to the head. If you prefer a game you can play solo, he suggests the strategy-based (and bloodless) game for iOS, Hitman Go. 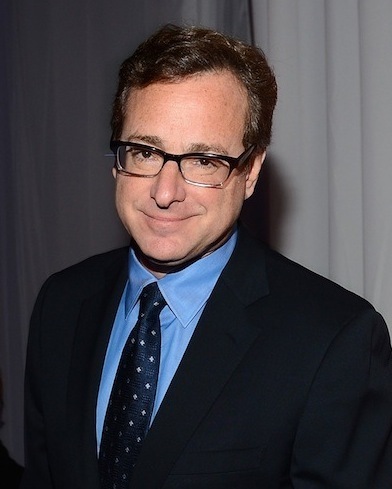 When Bob Saget was in his twenties, he had a lot of plates spinning. He tried film school (and dropped out after just a few days). 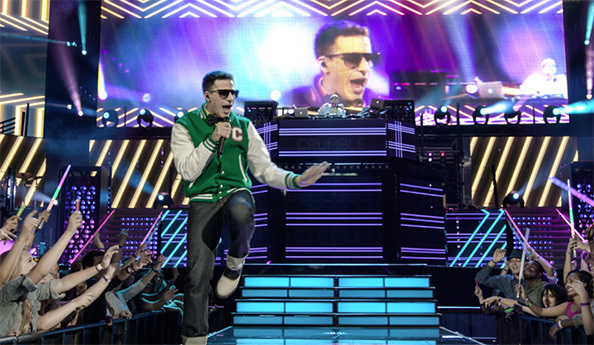 He performed stand up. He warmed up sitcom audiences. He appeared in a Richard Pryor movie. He even worked for a few months as a morning talk show host, before he was told he was "too hot for TV." But the part that changed everything wasn't controversial, or crazy. It was playing the straight man, on a sitcom aimed at families. And despite the schmaltzy moments and broad jokes aimed at kids, Saget is proud of his role as widower and family man Danny Tanner on Full House. He'll tell us why. Saget's new memoir is Dirty Daddy: The Chronicles of a Family Man Turned Filthy Comedian. 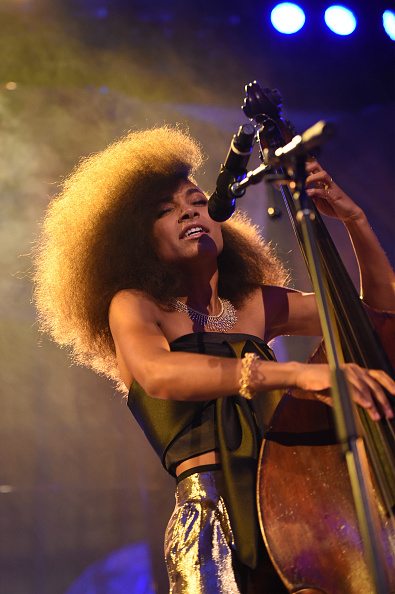 It's very personal and sweet and also sometimes vulgar, which is pretty much exactly what you might expect. He's also touring his new stand up show. You can find details on his website. 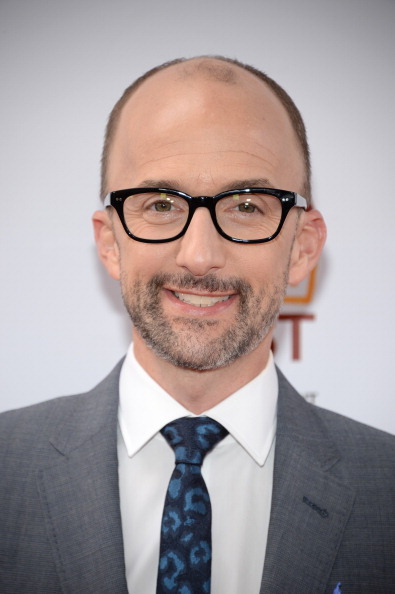 Jim Rash has a lot of irons in the fire. He's a regular on NBC's Community and hosts the Sundance Channel series The Writers' Room. When Rash isn't on-screen, he's writing and directing. With his writing partner Nat Faxon, he wrote the Oscar-winning screenplay for The Descendants. The pair also wrote and directed last year's coming-of-age comedy The Way, Way Back, which drew on some of Rash's childhood experiences. Rash joins us this week to talk about the awkward-yet-motivational summer talks he had with his dad and stepdad as a teenager, exploring writing techniques with TV showrunners on The Writers' Room, and writing for Community during Dan Harmon's absence. Community airs Thursday nights at 8/7c on NBC. The Writers' Room airs Friday nights at 9/8c on on the Sundance Channel. Wanna be pals with Jesse? Here's the litmus test. Matt Walsh is a longtime MaxFun hero. He was a founding member of the Upright Citizens Brigade and has performed in a wide range of popular comedy features including The Hangover, Due Date, and Old School. He also has an impressive resume in television comedy including a turn as a correspondent on The Daily Show and stints on many of our favorite shows, including Community, Children's Hospital, Human Giant, Apt. 2F, Reno 911 and, of course, the Upright Citizens Brigade. As his resume suggests, he is one of the top improvisational talents working today. 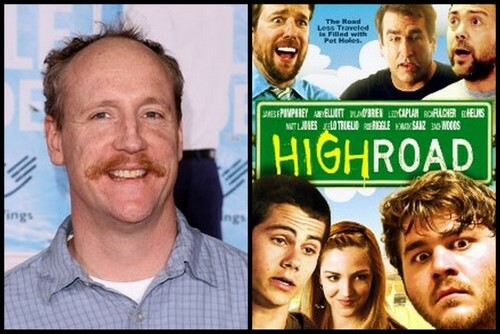 Most recently, Walsh made his directorial debut with the movie High Road. The film is composed of largely improvised dialogue and features a cast of top comedic talents including Ed Helms, Joe Lo Truglio, Rob Riggle, Horatio Sanz, Lizzy Caplan, Abby Elliott, and Andrew Daly. It's a very funny and clever coming-of-age road picture that I know our listeners will love. It's available now on DVD and digitally on iTunes. Last week, Walsh took a few minutes out of his schedule to talk with me about the film. Matt Walsh (MW): Did we meet at MaxFunCon? Rebecca O'Malley (RO): I don’t think so. I was there, but I don’t think we met. It was a lovely time, though. I was so glad that you could join us. MW: It was a tremendous event. Tremendous. RO: Glad you enjoyed it! I know that High Road is the first film that you directed. How long had you been developing the concept and the script? MW: It was a screenplay that I had written four years ago with a friend of mine, Josh Weiner. We spent a couple of years working on the screenplay. About a year after we decided that no one was going to make it, I decided that I would direct it myself. Initially, I was willing to do it for free; but we were eventually able to raise some money for the project. And about a year after that, we boiled it down to an outline. RO: If you have worked on a story for that long, how difficult is it to let your actors take charge of the dialogue. Did the movie start out as fully scripted? MW: When we wrote it initially, it was completely scripted. All of the dialogue. Then, when I decided to make an improv movie, I borrowed the story from that. I deleted some of the side characters and made it simpler. RO: Why did you decide to use improvised dialogue? MW: In my personal experience, the comedies that I have done that have been really fun have allowed for a certain amount of improv time. You’ll shoot the script – and then you get to play with it. And I had long been wanting to direct an improvised film. I had been involved with an improvised television show and I really enjoyed the process. So I felt I had a really good handle on it. And I’ve long been a fan of the genre – Christopher Guest movies, etc. And I’ve had so much exposure to improv during my lifetime that I felt it was something that I wanted to do. I wanted to crack that problem – delve into that challenge. So I’ve wanted to do it for a long time. And the material was very appropriate. As we had written it, I started to think of all the people I knew who could play the specific characters. The screenplay became a 120-page character description. RO: Was the main character based on any person or persons that you have encountered in your life? MW: Yes. I did have a friend who was a part-time pot dealer in Chicago. He was very talented – brilliant. But he had become stuck because he took an easy choice and ended up doing it long than he wanted to. And had he stayed there, his life may not have panned out very well. But he did step away from it and now he’s a successful person. But none of the other characters are taken from our lives. Though the game Milky Milky Cakey Cake - which is mentioned in passing - is based on a real thing. MW: You’ve seen the film? RO: Yes! And of all its elements, I never would have predicted that one as having some basis in your actual experience. MW: A friend of mine was in a band in high school and a father of one of the band members was abusing a substance one night. While doing so, he offered to have the boys stay at home with him one night and play "milky milky cake cake". It’s a game where you get a sheet cake, create a hole in the middle, and pour milk into it and eat it until all of the milk and cake are gone. RO: One aspect of the film that I really enjoyed was the documentary-style camera work. It made the story feel very intimate. Why did you choose that approach to filming? MW: First, a documentary crew can capture spontaneity better than others in their field. Anything can happen when you are creating an improv film. So I needed a crew that was experienced with being limber and ready to go. There weren’t many set up shots. They were capturing things as they happened. I had seen a film called Darkon which was a documentary about live action role players. And Hillary Spera is the woman who had shot that. I was lucky enough to get her for this film. The performances in this film are very real and natural. And documentary style helps to capture that feeling. RO: I also read that you asked your actors to do improv work for character development – including theater work on scenes that were not part of the film. Can you tell me more about that? MW: We did two weeks of theater camp. We went into the UCB theater and worked with the main characters pretty much every day and ancillary characters only for a few days. We wanted them to understand their back story, their world and their relationships. We also wanted to develop the proper tone for their dialogue. So we did, for example, classic interviews where I would ask them a half hour of questions. And then we would discuss the results to try and discover what was true about each character and what part of our discovery might naturally come up during the course of the film . We also did fun scenes that would never happen in the film. And we put groups together – like the band – so they would have a rapport and their friendships would feel natural and true. Improvising scenes did help their chemistry. And then Dylan O’Brien, who played the young boy, had had no improv experience. So it was a boot camp for him. I had plugged him into an intensive UCB course in addition to this two week theater camp. All to prepare him for suddenly entering the big leagues of improvisation. RO: That’s impressive. I’m sure many actors would have found that intimidating. MW: Yes – and he was great. He was a solid comedy fan – starstruck with everyone he met. RO: Who wouldn’t be? After you completed camp, how did you go about rehearsing the actual scenes? How does that work in an improvised film? How do you keep the scene fresh? MW: In the theater rehearsals, we never did any scenes from the film in order to preserve spontaneity. Occasionally, though, there were jokes that we would come up with during rehearsal that we would keep. Or that I would remind the actors about on set. But once we were on the set – it was pretty traditional. I would talk to them about the scene and we would rehearse it in order to familiarize everyone with the blocking and the staging. And then we would shoot the wide. Hopefully, we would get it after a few takes and then everyone would feel comfortable with the rhythm. Then, if there were elements that were popping up that were new and funny, as we went in for singles and closer coverage, we could do multiple takes and multiple variations on it. RO: Well, the end product is wonderful and I thoroughly enjoyed it. I want to thank you specifically for including the concept of a White Stripes cover band in the film. Extremely funny. MW: (Laughs). My friend and co-writer, Josh, is obsessed with them. So he got me hooked on that idea. Chris Gethard is a comedian and host of The Chris Gethard Show on NYC's public access television. He talks to us about booking megastar P. Diddy at a tiny theater in New York, using both mania and depression to shape his comedy, confronting Internet trolls in person and -- okay, an unusual event in his childhood involving a dwarf. His new book is A Bad Idea I'm About to Do. Craig Rowin has a message for the millionaires out there. Listen closely. You can find more from him at CraigRowin.com, including information about his shows at the UCB Theatre in NYC. MaxFun friend (and TSOYA and JJGo guest) Matt Besser has been working on a project to get kids high on sketch comedy, and it's airing this week. Hear his plea for comedy, not drugs, below. My name is Matt Besser, one of the founders of the Upright Citizens Brigade Theatre and one of the creators of This Show Will Get You High. A year ago I approached the leaders of Comedy Central with the idea to create a sketch show so funny that it had the power to get the viewer high. I theorized that if we can get the kids high on sketch comedy, then they won’t have to be in the empty lots and the abandoned malls looking for real drugs like heroin, crack, and worst of all, marijuana. To accomplish this dream I recruited some of the best sketch comedians from the UCB Theatre including Brett Gelman, John Gemberling, Paul Rust, Betsy Sodaro, combined with the directing genius of Eric Appel, plus Nathan Barnatt, Sergio Cilli, Allan McLeod, and Jessica Williams. Upon completion of the experiment, Comedy Central showed it to focus groups where it was determined that it got them way too high. It has since been decided that the safest time to exhibit the special are the hours when only those who are used to being “way too high” are still awake. On November 2, citizens in communities across America will vote on various marijuana legalization propositions. Before that date, America needs to wake up and realize that you don’t need to get high on the weed, when you can get high on This Show Will Get You High.